Paper lanterns are an expressive way for kids to display their artistic talents. 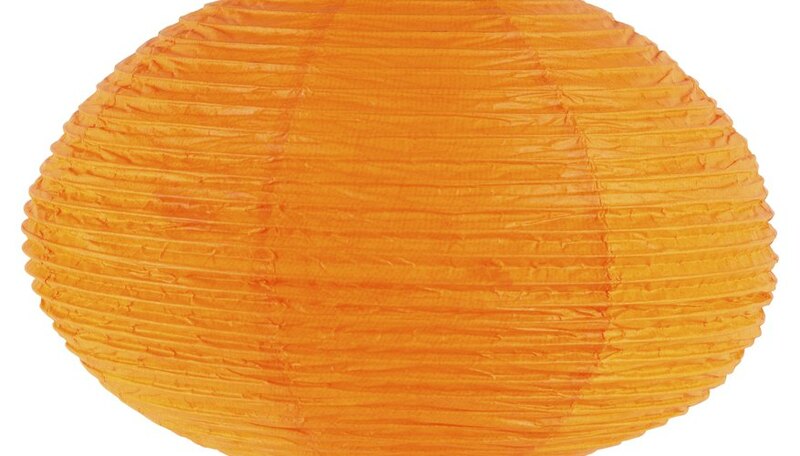 Lanterns can be strung together to decorate homes, classrooms or even outside parties. Even the smallest children can learn the art of putting together a few inexpensive materials to make circle paper lanterns. Follow a simple pattern and feel free to make variations for holidays, including Halloween and Christmas. Begin with a 6-inch circular Styrofoam ball. Use a larger size for a bigger lantern. Make a circle template by drawing a 2-inch circle on a piece of light cardboard or card stock paper. Cut out and trace the circle on colored tissue paper. Make approximately 30 circles or enough to cover the Styrofoam ball. Cut out circles. Use 1-inch double-sided transparent tape and attach it in the middle of the circle to the bottom of the ball. Affix the next circle using the same method. Overlap the circle on the ball by about one inch. Attach the rest of the circles forming a circular row around the ball. Form the rest of the rows working your way to the top of the ball. Tape the last circle at the very top of the ball. Take a 12-inch piece of yarn and form a loop at the top. Tie the loop with a square knot, making the loop large enough to hang from a hook in the ceiling or under an overhang outside. Pin the other end of the yarn to the top of the ball using a straight pin. Hang the circle lantern. Use variations instead of tissue paper for different effects. Fasten circles of construction paper or glow-in-the-dark neon paper. Make different templates, such as stars or poinsettia leaves. Attach three-inch strips of colored crepe paper. Create a paper lantern with an accordion top. Spray paint the Styrofoam ball. Horizontally fold a piece of 8 1/2-inch by 11-inch typing paper one inch from the top. Turn the paper over and fold another one inch. Continue to the bottom of the paper until you have made an accordion effect. Repeat with two more pieces of paper. Keep the papers folded. Thread a needle and insert it through all pieces of paper about one inch from one of the ends. Tie the two ends of thread together in a knot. Unfold all the paper and form a circle. Tape both ends together if needed. Pin to the top of the ball.